My previous post on building an Art-Net to DMX interface using an ESP8266 seems to be getting a lot of attention. However, from the comments it is clear that a lot of people that build it themselves have difficulties to get it to work, or don’t get it to work at all. This post investigates this in more detail. We have not been using these interfaces in our performances for quite some time, and started wondering whether there is something wrong my firmware. My implementation goes back to April 2017. Over the course of time there have been some updates to my code. Furthermore, the Arduino IDE has been updated, as well as the ESP8266 core for Arduino. Recently I received all three interfaces back that I had built for my 1+1=3 collaborators and decided to update the firmware and to test them. One of them did not work at all due to a broken connection between the power supply and the Wemos D1 mini; two of them started just fine. After fixing the broken wire and updating the firmware on all three of them; they started up just fine, showing the green light (indicating a connection to the WiFi network) and on the monitor page of the web interface I cold see that Art-Net packets were being received. However, with my DMX controlled light it did not work at all. Using an Enttec Open DMX interface and the very nice JV Lightning DmxControl software (which supports both Art-Net and the Enttec Open DMX), I set out to debug the issue. Since DMX is all about timing, I connected my DS203 mini oscilloscope to pin 2 and 3 of the DMX connector. I found detailed schematic information about the timing of the DMX protocol on this page. Searching for oscilloscope images of DMX signals, I also found this page with information. Comparing the output voltage with the DMX512 schematics, it became clear that something was wrong in the signal. To make it easier to see the full signal on the oscilloscope, I configured only three DMX output channels, all set to zero. The oscilloscope shows 5 similar blocks; changing the value for DMX channel 1, I see that the 3rd block changes – that is apparently the first channel. Prior to that should be a “start code” with value 0, so the last 4 blocks make sense. But the first block is too short; there is also a very short pulse all the way at the start which does not match the specification. By connecting the Enttec Open DMX to my DMX controlled light, I could confirm that the combination works and that the DMX interface to my light is not broken. Connecting the Enttec Open DMX to the oscilloscope, I see that it has a much longer 1st block which is the “space for break” (labeled 1 according to this), and slightly different 2nd block which is the slot with the “start code”. Following is a whole series of blocks/slots corresponding to the DMX channels. In this case I cannot limit the number of DMX channels, so the series contains a full universe of 512 channels, each of them set to zero. Changing the values of the first few channels in Lighting DmxControl, I can see the corresponding change in the signal on the oscilloscope. Since a static photo of the oscilloscope screen does not show that there is quite some jitter, especially in the first part of the signal, I uploaded a short video recording of the Enttec Open DXM signal. As the initial “break” signal was apparently not correctly implemented in my firmware, I changed the code to use the low-level implementation of the break that was contributed here. Using 3 DMX channels again, this results in a good DMX signal. I investigated the problem with the original code, which consists of switching to a slower baud rate, sending a single byte as the break signal, and switching back to the original baud rate of 250000. Given that the “break” appears just as long as the other bytes, the switching of the serial port speed apparently fails. On the Arduino forum I found a post that suggested to flush the serial port prior to and after changing the speed; I implemented this and now the break signal looks fine again. I think that the reason that it broke is due to updates in the Arduino version that I am using, and/or updates to the ESP8266 Arduino core. I guess I must have been lucky with my buggy initial implementation; this may explain why it failed for some people and worked for others. Connecting my Art-Net to DMX512 adapter with updated firmware to the DMX controlled light initially did not work; increasing the size of the DMX universe that is is passed on by my Art-Net to DMX512 adapter solved this. After some trial and error it turned out that – although I had configured the DMX light for three channels (R, G, B) – it would not work if it would receive less than 8 channels. I suppose this is because the light has a 3, 4, and 8-channel DMX mode, and that 8 channels is apparently the minimum for DMX input to be properly handled. Looking back at the videos, I see that the timing of the Enttec Open DXM controller is the worst, especially in the space for break and the mark after break (MAB). This is actually a known characteristic of the Open DMX, since timing is controlled by the serial (USB) port of the computer rather than by a dedicated microprocessor; that is also the reason why it is not recommended for serious applications. My own EXP8266 firmware with the low-level code for the break shows less jitter for the break. Using the “slow serial byte” the jitter is totally gone for the break itself, but there is still some jitter in the duration of the MAB. Regardless of the jitter, all three are working fine with my DMX controlled light! Having seen the timing of the signals in detail, I am also more confident that they should work with other DMX equipment. One thing I noticed however and don’t have a solution for right now, is that the differential voltage of the Max485 modules that I am using is considerably lower at ~3.5V than that of the Enttec at nearly 8V. To summarize, I was glad to have the Enttec Open DMX USB adapter for testing, and especially for having the DS203. If you are doing electronics like this, I can really recommend to get an oscilloscope! Besides testing with the Lightning DmxController software, I was also able to confirm that it all works smoothly again with our EEGsynth, using a patch consisting of the redis, inputcontrol and outputartnet modules. This entry was posted in Arduino, Electronics, Hardware, Technology and tagged artnet, dmx512, eegsynth, esp8266 on April 6, 2019 by Robert. For the EEGsynth project I have developed a full-body 8-channel motion capture system. It is based on the MPU9250 9-DOF inertial motion unit, which contains a three-axis accelerometer, gyroscope and magnetometer. I have combined this with the Madgwick AHRS algorithm, which takes the raw sensor data and computes the yaw, pitch and roll. The design is based on one battery operated main unit that is worn for example in a Fanny pack around the waist, and up to 8 sensors that are attached to the arms, legs, etc. The main unit contains a Wemos D1 mini, which is based on the ESP8266 module. It uses the TCA9548 I2C multiplexer to connect a maximum of 8 MPU9250 sensors. The data from the IMU sensors is streamed using the Open Sound Control (OSC) format. The sampling rate that can be achieved with one sensor is around 200 Hz, the sampling rate for 8 sensors is around 60 Hz. For initial configuration of the WiFi network it uses WiFiManager. After connecting to my local WiFi network, it has a web-server through which the configuration can be set, which includes the number of sensors and the destination host and port for the OSC UDP packets. For the IMUs I am using MPU9250 modules that I purchased on Ebay for about 3 USD each.The MPU9250 units fit very nicely in a Hammond 1551MINI enclosure. I designed the enclosure for the main unit in Fusion360 and printed it on my Prusa I3 MK3 3-D printer. I made two motion capture systems so far, one with black and one with white PLA filament. The Arduino sketch and more technical documentation can be found here on GitHub. This entry was posted in Arduino, Electronics, Technology and tagged eegsynth, esp8266, osc on June 24, 2018 by Robert. I have a Multitech MDOT-BOX for testing. Configuring it for TTN requires the following connection to a computer, after which AT commands can be used to probe and set parameters. The following resets the MDOT to factory defaults and shows the configuration overview. From the Multitech documentation: In OTA mode, the device only needs to be configured with a network name (+NI=1,name) and network passphrase (+NK=1,passphrase). The network session key, data session key, and network address are all automatically configured. This entry was posted in Arduino, Electronics and tagged lora, ttn on October 8, 2017 by Robert. Update 6 April 2019 – I wrote a follow up post on the timing and jitter in DMX512 signals and fixed a bug in the firmware. Update 26 May 2017 – added photo’s of second exemplar and screen shots of web interface for OTA. Professional stage and theatre lighting fixtures are mainly controlled over DMX512. To allow a convenient interface between the EEGsynth and this type of professional lighting systems, I built an Artnet-to-DMX512 converter. It quite closely follows the design of my Artnet-to-Neopixel LED strip module. This entry was posted in Arduino, Electronics, Technology and tagged artnet, dmx512, eegsynth, esp8266 on April 28, 2017 by Robert. Together with the TTN Nijmegen community we are discussing possible applications of remote sensing nodes in Nijmegen. To get a better view on the TTN coverage in Nijmegen and to get a feel for what works (and what not), we are working on the implementation of some nodes. The PoC2 TTN gateway will soon be installed by Michiel Nijssen at Maptools in Molenhoek. To help Michiel get started, we agreed that I would give him a fully functional node to play with. Michiel came up with a very concrete idea: it consists of a GPS-enabled temperature sensor that sends the data over LoRaWAN/TTN. Below you can find some details of a very fist implementation. I estimate that the material costs amount to 50 euro. It still needs to be soldered in a more sturdy form-factor and a battery and enclosure need to be added. This entry was posted in Arduino, Electronics, Technology and tagged raspberry pi, teensy, ttn on April 14, 2017 by Robert. As explained in a previous post, for the EEGsynth we want to use a neopixel array that can be controlled wirelessly using the DMX512 protocol. I purchased a number of Adafruit neopixel rings with 12, 16 and 24 elements respectively. 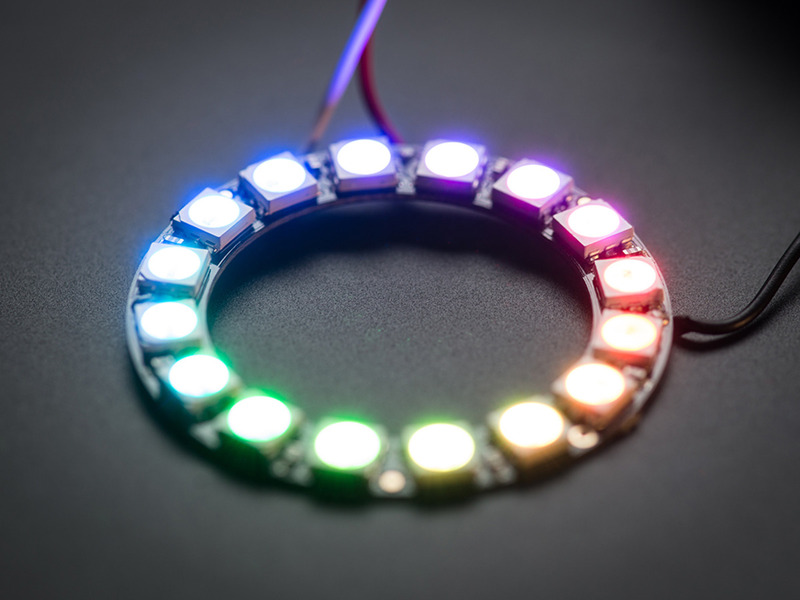 Each RGBW pixel contains a red, green, blue and white LED. For the 24-pixel ring that means that there are in total 4*24=96 LEDs of which the intensity can be set. The ESP-8266 module is a versatile WiFi module that comes in many versions. During development I especially like the NodeMCU version, which mounts the ESP-12 module on a development board with USB connection, and the even smaller Wemos D1 mini board. The Wemos D1 mini is hardly more expensive on Ebay than the simpler bare-bone ESP-8266 modules. The hardware connection is simple: I connected Vcc and GND directly to the Wemos D1 mini board, and connected pin D2 to the data-in of the first pixel. Although the Neopixels are specified for 5V, in my experience the Adafruit rings also work fine at 3.3V, both for power and for the serial control signal. Each LED can take up to 20 mA when fully bright, which means that all LEDs of the 24-pixel RGBW ring can take up to 24*4*20 = 1920 mA, or close to 2 A. However, not all LEDs will be at full intensity at the same time, and driving them with 3.3V rather than 5V further reduces the current. I encountered no issues powering them over the USB port of my MacBook. For the EEGsynth we want to map a small number of control signals to aesthetically pleasing light effects. E.g. it can control the hue, the frequency with which the array flashes, or the speed with which a bright bar rotates along the ring. This entry was posted in Arduino, Electronics, Technology and tagged artnet, dmx512, eegsynth, esp8266 on January 1, 2017 by Robert. The X-mass holiday is always a nice time of the year to spend studying and tinkering on electronics projects. In the EEGsynth project we have identified that it would be cool to control light with brain and body signals, besides controlling modular synthesizers which we have focussed on so far. As it is not yet clear what kind of light and what kind of control will conceptually and aesthetically work well on the EEGsynth control signals, I have been studying both small and large lighting systems. We might for example want to use small and wearable lights on a performer, or control the stage light, or use a LED strip as indicator of the EEG-extracted control signals. In theatrical and stage performance lighting there is a clearly dominant standard: DMX512. For lighting setups there are many fixtures (i.e. lamps rigged on ceiling mounted truss) that can be remotely controlled over DMX512, not only on-off, but they can be dimmed, the color can be changed, spotlights can be moved, etc. If you look on for example on Thomann, you’ll see that many light fixtures support DMX. Going to the smallest systems, I considered individual LEDs. Neopixels are a very interesting type of RGB LEDs, which combine a red, green and blue (and sometimes white) LED in a single few-mm small housing together with a controller chip. The controller chip allows the individual LED intensities of the neopixels to be addressed over a serial controller by a microcontroller such as an Arduino. Furthermore, multiple Neopixels can be daisy-chained, where each pixel in the array can be addressed. LED strips consisting of 30, 60 or even 144 pixels per meter can be purchased per meter, for example on Ebay. For the the EEGsynth it is desirable to have a single control module that provides a uniform interface between ExG control signals and light control. An individual neopixel can be considered as an RGB lamp, just like a theatrical stage light. The intensity of the red, green and blue can be controlled, just like the DMX channels of a stage light. Controlling a small LED jewel worn by the performer should not be different than controlling the light of the stage on which the performer acts. An important difference in the requirements for fixed stage lighting and a small wearable LED jewel is that the first must hook up to existing DMX512 cabling systems, whereas the second should be wireless. This is where Art-Net and the ESP-8266 come in. Art-Net is a protocol for sending the DMX control protocol over a network. The ESP-8266 is a small and low-cost microcontroller combined with a WiFi chip that is compatible with Arduino. Further details on the hardware and firmware design for the actual light controller modules will come in a series of follow-up posts. This entry was posted in Arduino, Electronics, Technology and tagged artnet, dmx512, eegsynth, esp8266, neopixel on January 1, 2017 by Robert. Since I encountered some initial difficulties in programming the ESP-12 version of the ESP8266 module using the Arduino IDE, let me here summarise some findings based on information from [1,2,3]. The ESP-12 module exposes 11 GPIOs. Three of them are especially relevant, as they determine the bootloader mode at startup or following reset. Furthermore, CHPD should be pulled up and RESET should be pulled up or should be floating. If you connect RESET to ground, the module resets. I have not yet figured out what the SD-Card boot means, so in my applications GPIO 2 should always be pulled up and GPIO 15 should always be pulled down. I am using 10k resistors, but smaller values (e.g. 3.3k) should also work. To facilitate development, I connected two push button switches to the GPIO 0 and RESET pins, shorting them to ground when pressed. When the buttons are not pressed, they are both pulled up to 3.3V using a 10k resistor. This entry was posted in Arduino, Electronics, Technology and tagged esp12, esp8266 on September 18, 2016 by Robert.